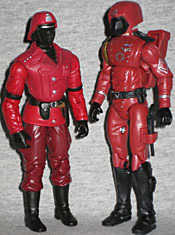 According to YoJoe.com, a site that would know these sorts of things, there have been 15 different Crimson Guard figures released since 1985 (or 16 if you count Agent Faces), and all but one of them have been wearing the same basic uniform. You know the one: the button-front red suit, the epaulets, all that. It's the classic Crimson Guard look. The one oddball in these ranks is the 2005 DTC version. The Crimson Guard troopers are elite shock troops of the Cobra legions. Each must hold a degree in either law or accounting as well as being in top physical condition. After rigorous training in Cobra combat and tactics, each "Siegie" undergoes plastic surgery (performed by the Cobra surgeon Scalpel) so that each trooper will look similar. Afterward, each is given his new assignment: a new life, in a new city. Crimson Guard troops are too precious to be wasted on the conventional battlefield and are instead expected to become valued members of the community, to climb the political and corporate ladder into positions of importance. Forming this force is thought to be one of the first actions of Cobra Commander after he formed Cobra; the "Siegie" network may have been in place already for more than 10 years. At least two, and perhaps more, prominent members of Congress (and dozens of lobbyists) are rumored to be "Siegies" in deep undercover. Watch out. That town mayor of yours might just have a red uniform hanging in his closet! DTC, to those who missed out on it, was Hasbro's Direct To Consumer plan, which kept the 3¾" figures coming when most stores didn't want to carry them. Originally available only online (and eventually at Toys Я Us), the DTC line offered new versions of classic favorites, which is why this Crimson Guardsman isn't the same as all the others. While the classic Siegie get-up is quite ornate, it still looks like it would function as battlefield gear - it's fancy, but functional. The DTC version, however, is more of a dress uniform. It's what Siegies would wear to formal dinners. He's still wearing black gloves and boots, but other than that, things have really changed. The pants are now jodhpurs, and the button-front shirt has been replaced by a fashionable double-breasted jacket. There's a silver Cobra emblem on his left arm, a pocket over his heart and a holstered pistol molded to his belt. The head is a unique sculpt, though it's definitely inspired by the original CG helmet - it's certainly closer to that than the TFAC ape-faces. It's a red helmet with a silver crest on the forehead, worn over a black mask with a grill over the mouth and nose and a single silver eyeslit. Judging by the sculpted details on the sides, the two pieces of the helmet latch together around the wearer's head, to prevent it from falling off in the heat of battle: after all, it wouldn't do to have the Siegies outed in their real lives; I mean, you see one Fred, you've seen them all. The Crimson Guard has an updated version of the V-shaped backpack the earlier figures wore, which is larger than the original (so you don't get confused). I guess he has to carry more stuff, these days. His only weapon is the same black HK USC that came with Bombstrike, but it's a good stand-in for the original CGs' assault rifles. As a true 3¾" figure, this Crimson Guard looks a bit pint-sized next to his TFAC brothers, but perch him on one of their stands, and you won't notice the difference. Besides, there's nothing in the Siegie specifications about a minimum height requirement - who knows, maybe being so short made this guy particularly vicious. The colors are more vibrant, with a bright red for the jacket and maroon for the pants. Between that and the unique uniform, I've decided that for my army, this guy is going to be a Crimson Guard Commander, overseeing the others. After all, Tomax and Xamot can't constantly be directing their troops.